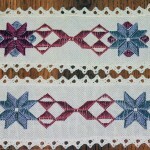 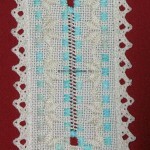 The design is by Roz Watnemo, sold through Nordic Needle as the kit Basic Hardanger, Bookmark #4. 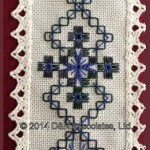 The design is by Roz Watnemo, sold through Nordic Needle as the kit Basic Hardanger, Bookmark #3. 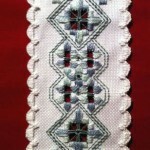 Stitches taught in this kit: Satin stitch (kloster) blocks, solid motifs, Smyrna and three eyelet variations. 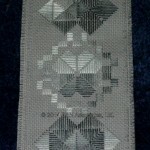 Stitched on 14 count grey Aida and backed with same fabric. 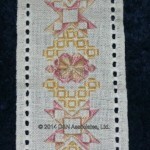 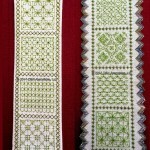 These bookmarks are basic hardanger, no cutting.